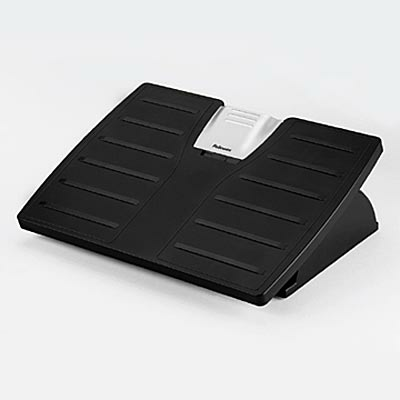 The Fellowes Ergonomic Footrest with Microban® adjusts for personal comfort using foot pressure—no bending or stooping required! Locking mechanism holds foot rest in position until you readjust it. Three different height settings available. Features built-in Microban® antimicrobial protection to inhibit the growth of stain- and odor-causing bacteria for the life of the product. 17-1/2w x 13-1/8d x 4-3/8h. Manufacturer's one-year warranty.